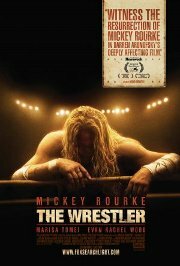 Mickey Rourke gives a standout performance playing an ageing professional wrestler. He's getting on in years, but has no other means of making a living apart from performing in the square ring. Although the fights are scripted, the fighters still get battered. It's a tough life. He's also trying to patch things up with his estranged daughter, while trying to get romantically involved with a pretty stripper, who insists that she is unavailable. How about a round of one-on-one? Comments Strong bloody violence within wrestling context. Strong dramatic theme. Some explict drug usage.